It's no mystery: finding the right wedding dress for you can be tricky. How much should you spend? What style best fits your figure? Should you go traditional, couture or avant-garde? These and many other concerns swirl around your mind while you go through the long process of selecting a dress. Before you start hunting, use the rating tool below to determine what qualities and features you value the most for your dress. 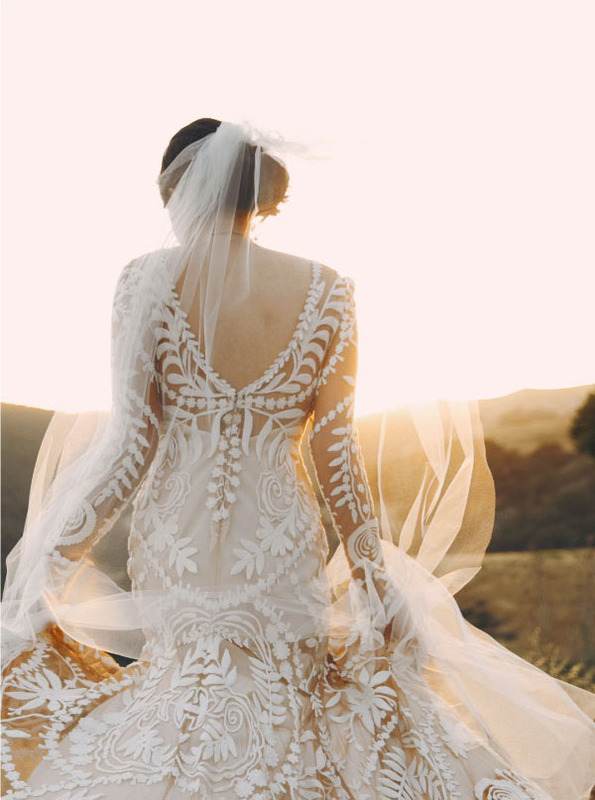 This will help identify what really matters to you, and make the process of finding that perfect wedding dress more enjoyable and less stressful. Hopefully, the only spinning around you'll be doing will be saved for the dance floor. Rate each statement from 1 (not at all important) to 5 (extremely important). Then read below to find out what your preferences mean. OK, you have searched your heart, soul and wallet for an honest estimate of what you will focus on when purchasing your wedding dress. Now find out how your responses should determine your considerations and adjustments when it’s time to get real and say yes to the dress. If you gave 4-5 points to statements A, B and C, you have very high expectations about your gown. Hopefully your budget can meet them! A custom-made dress should be in your sights. For that, figure no less than $6,000 as a starting point. The price could double or even triple depending on the materials and intricacies of the design and finishing. You will meet with a designer at least twice to discuss style and materials, with sketches to pin down what the final dress will look like. Expect at least four fittings before a final press. Then carry away with the dress of your dreams. If you selected statement E with 4 or 5 points, there may be smooth sailing or really rough seas ahead for you. It's admirable that you are firm on sticking to a budget. But if you end up going over a little, know that it’s still possible to adjust in another area of the wedding. If you think about it, it’ll be worse to know you stayed on budget, but don’t feel you look your best. Or if your mind keeps going to that other dress you really loved that was a few hundred dollars more, but you wouldn’t let your-self splurge on. Granted, your wedding is just one day in your life, but you will be looking at those photos for a lifetime. So keep your eye on your wallet, but listen to your heart, too. If F was among your highest rated statements, you are very attentive to how you appear to others. Everyone wants to look their best, yes. But let’s face it: you may be stuck on a particular color or silhouette while not considering other looks. It's admirable that you are firm on sticking to a budget. But if you end up avant-garde and select a black dress. What really matters (and this import-ant!) is how you feel when you put the dress on. If it’s the right one, some-thing special will happen. If you feel beautiful, you will look beautiful. Photographers can always show your best features with different angles and lenses, but what really matters is that you feel like a bride from your core. And that when you look in the mirror, all you see is joy. If you selected G, H and/or B as high preferences with 4-5 points, you really appreciate the designer-label ﬁner dresses that everyone wants to be able to afford. You should be open to trying on several different designers, even some indie designers who are not well-known yet. Quality is also important to you, so it's probably best to stay away from any imitations or knock-offs. Finally, if you gave 4-5 points to statement I, you may be setting up yourself for a long and tedious journey to ﬁnd the exact dress you have in mind. The market for bridal dresses is as varied as the price ranges. Sometimes you look and look online and find the right color, style, length, lace and crystal details. But when you go and try the dress on, the lace looks cheap, and those beloved crystals and pearls are glued and not sewn on. Now what? The best option is to keep an open mind and trust the bridal consultants you meet at a salon. Make an appointment. Send images ahead of time, so if the store has the same manufacturers, they will find out if they already have it in stock. Giving a high rating to J has more to do with challenges in reaching ﬁnal decisions, or the fear of making a costly mistake, instead of liking everything you see. After all, this is a big and very important purchase. No one, unless they are in the public eye and go to many galas, normally puts so much money toward one event dress! If that’s your case, now is the time to take a look at your closet. See what silhouettes you tend to wear. What necklines you like. How important movement and weight of fabric are to you. Pairing down on style materials will help. Give some thought about exterior factors too, like anticipated weather conditions, walking up and down lots of steps, and if the wedding is casual or formal. This will help fine-tune your search and give you a more focused approach to your final decision. One last special note. Many salons want to carry a line of dresses that are only found at their stores. Often the salon will advertise dresses featured in magazines or online website as exclusive to their store. In truth, many manufacturers make slight changes in necklines, details or embellishments to a stock design or style to say a dress is exclusive to their stores. 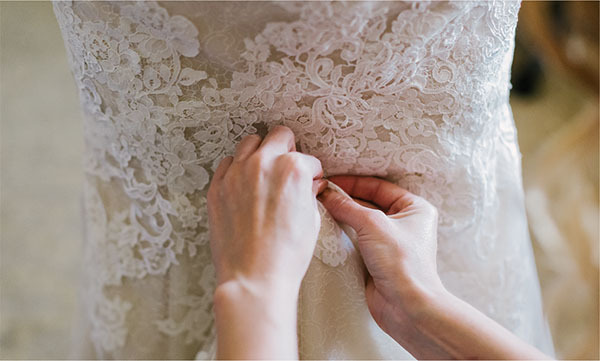 Chances are that a good seamstress can make alterations to enhance or change a detail, at a reasonable extra cost, to resemble the dress you had in mind, if for whatever reason it isn’t available at your salon of choice.